Wire Menorah/Votive Sleeves by Annie Modesitt from Melanie Falick’s Handknit Holidays. Most of the details did not change from the first time I knit these beauties. Every project is a learning experience, however, so minor improvements included using size 6 beads in colors that would show up against the silver tone wire, and using 26 gauge wire. To follow-up on our discussion of appropriate wire thickness for knitting: many of you were shocked that I was using 24 gauge wire, but that is exactly and precisely what the pattern recommends. I guess I didn’t know any better! I think switching to 26 gauge made the knitting easier and quicker, but I still felt like a giant throbbing blister the next morning. So, I maintain that taking it easy and knitting only a few rows at a time is the way to go. Of course I just plowed through the remaining three votive sleeves in three nights. Impatient? Who? Me? 🙂 Pass the Tylenol, please. They’re beautiful–your mom will be thrilled. Can’t wait to see what you start next–something from Victorian Lace maybe? They look stunning, though. I am glad you got them finished – your mom will be in 7th heaven (not the tv show, though). In other news, I just finished my first pair of Jaywalkers! Woooot! Love that pattern, I so do!! It was worth checking back for the pictures. They are beautiful. Although my hands ache when I see them, I used to hand craft bridal headpieces and the wire just killed. Wow – now that is dedication! She will love them. I have never considered a project like this, but seeing them on your blog as proof that a real person can craft such a thing is certainly inspiration. Beautiful! I’m sure you mom will just love them! The pain will all be worth it when you see you Mums face when you give them to her. They do look very pretty. Those look lovely! I’m sure your mom will be very pleased. Do the beads cast off flecks of color when you light a candle inside? They are beautiful 😀 Congratulations for persevering and knitting ALL of them in marathon fashion 🙂 I’m sure she will be really happy with them. Those a fantastic! Such beautiful colors and beads that you chose. Your mother will love those. They are wonderful. I have found my CHristmas knitting for next year. Thanks for the tips on the smaller wire – I’ll make a note! Oh my!!! Gorgeous, simple gorgeous! If I were your mum, I would demand my own set too! I find myself working with 28 gauge half hard sterling silver wire. It crochets nicely. 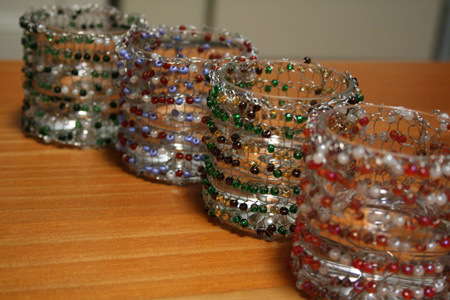 Check out http://www.artbeads.com and that free shipping for all of their stuff. It is like a dream come true for we crafty women! They look great. 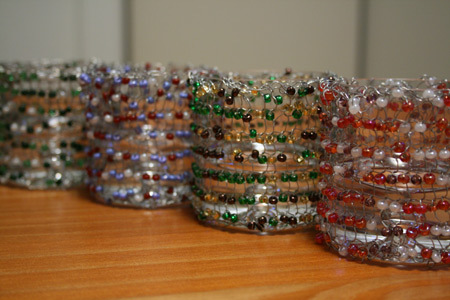 I have just bought wire and beads to make napkin ring holders with the same technique. Gorgeous! I am totally adding that book to my cart next time I order from Amazon. Thank you so much for the inspiration!! What a load off, huh? So beautiful! I have tendonitis in my wrists that acts up occasionally, so the thought of knitting with wire is so very painful, but they are sooo beautiful, I am very tempted. My own mother would LOVE them! The thought of knitting with wire just does not excite me. Oh, but your beautiful votives do. What a labor of love! Well worth the wait for the photo’s. What a lucky Mum you have. I’m sure she’ll love them. They look great. You have captured my fear of trying these in a nutshell. If I make some for myself, my mother, sister and best friend will all want them too. Wow! You are a wonderfuly daughter. They’re beautiful! Absolutely BEAUTIFUL! I have a feeling your mother is going to love them! Hi Kathy, I’m not sure if it’s a problem on my end but for some reason the pictures on your blog aren’t showing up anymore. I just get x’s and if I right click to show picture that doesn’t work either. Love your blog. They are beautiful. I like you choice of bead colors. Your Mom will be so happy. Great work and very inspiring. Thank you for sharing your tips. They were definitely worth the pain! Finally got the pictures! They are lovely! Those votive holders will be the hit of the Thanksgiving table! I love that they coordinate, and yet each one is an individual. I have been yearning for at least one of the holders since I first saw the ones you made for yourself but I know my 57-year-old hands cannot handle such a project. Are you sure you don’t want a Puerto Rican auntie in NY? She would be so grateful if she got a little giftie…Just joking (maybe). Your mother is going to be so happy and proud! The beads do show up nicely on these ones. hehe, the things that motivate us to finish something. I’m sure your mom would love and appreciate the votives. They look awesome & a little owwie with be well worth it for the smile on mom’s face! My gosh, these are absolutely fantastic! It must have been quite an effort to knit with the wire – but the result is more than amazing! Very classy. Your mom will love them. What a great job! I love them but cannot even begin to imagine doing it. Again, great job. Wow, they look great. I imagine they would make a lovely center piece for upcoming holiday gatherings. Gorgeous and way to go buckling down and getting those done. yay you ! for getting them done. i’ve tried knitting with wire. it does make a mess of your patience and your hands. I have yet to figure out how to e-mail you (I can’t sign in through Outlook), but I wanted to let you know there’s another Odessa out there! Check out my blog. Thanks again for the pattern! Good job getting them done! Now you can knit whatever you want with an unburdened conscience. Those are absolutely gorgeous! Your mother will be thrilled. And you’ll be happy knowing that she can use them throughout the holidays! They really are very pretty. I hope the Tylenol kicks in soon for you though. They look great! Your mom will be so pleased!!! So happy the pictures are back. I’m glad I didn’t know what I was missing. Now I’m going back to go over everything. Oh, the splendour. these are absolutely STUNNING. Beautiful work. Note to self: I must try these. Note to self: do not refer to these pictures again, because mine will never compare! These are great. Thanks for sharing, and more thanks for sharing on the gauge change. Super late here, but they look wonderful!